Alone in the woods when the horseman sounds. T’was a dark moonlit night. The air grew cold, wrapped in a growing mist. He had tread far along the leaf-clad path, straying some distance from the village. The winding branches of the forest trees limberly spilled over the cowering figure. The crack of thunder and the whip of lightning struck in the black sky. He cowered lower, raising an unsteady arm to his brow to clear it of his sweat. He swallowed hard. And he continued along the trail. His heart raced, his blood flowed manically through his veins. Another pace forward when he heard the haunting fathom of the horse’s morbid neigh. He turned heel and quickened pace for the village. His slouch slouched lower as the thunder thundered louder. The breeze that had followed him into the woods grew into a wind as he neared the edge of the woods. Clouds formed in the sky, taking the shapes of ghoulish creatures. The morbid neigh of the horse sounded closer. Galloping hoofsteps patted in the distance. It would not be long before it reached him. He sank to his knees in fear. He clasped his hands together, his eyes now tightly shut. The galloping drew nearer. Nearer. His fear peaked. Around the bend, the horse would be soon. The hairs on his neck and arms rose like a frightened cat’s. 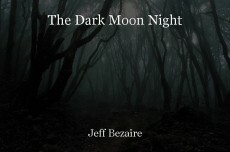 He could hear the leaves rustle as the night’s mare trampled over them. The frightened figure covered his face. The horse’s heavy breathing reached his ears. The ground trembled with each hoof fall. He remarked a cry of fear. A rush of air blew past his cowardly form, then . . . utter silence. Not but the sound of the breeze whispering amongst the creaking branches overhead. The thunder had calmed, yet the lightning flickered. The figure peeked between his fingers to see nothing but the path that lay ahead. He sighed with relief and brushed the sweat from his brow. It was time to return to the village. Ah, the old ghost horse of the plains story, much like, I think it was, 'High Plains Drifter', or not. I guess that wasn't about a haunted horse, but still an excellent story, Jeff! Thank you so much, Mike. This is actually inspired by the tale of Sleepy Hollow. Strangely enough, this reminded me of the unofficial sequel to The Wizard of Oz called "Return to Oz". There was a guy in the movie who had a removable pumpkin head, I believe his name was Jack. He was a comic character, I think. He never said anything serious. Since I had him in mind while reading this, it became a bit less scary... he resembles the headless horseman, most specifically in the pumpkin head with the carved face. I doubt you've ever heard of the movie as it wasn't too popular. It was a great childhood memory for me, so thanks for bringing that back :) This is one of those pieces that would be excellent with the right music playing while reading. Good stuff. Thank you for reading and commenting, Hanorbi. A dark and stor- moonlit night! A short story that held me captive throughout. Now I must return to the village. Thank you for reading, Mr. Watson. If this were my doing, the complete line, (His slouch slouched lower), would be in a poem as well, it has so many possibilities. --- You fooled me again, I thought for sure his head was coming off in the last line. --- Great read, it flowed so well and held me in that place of, "watching him from the sidelines". Great write!